A comprehensive, yet simple, complete, and cost-effective hybrid cloud backup and disaster recovery solution. The most reliable and easy-to-use cloud backup for businesses of all sizes. Acronis Backup solution delivers the data protection that meets today’s data demands. It keeps your business running, protecting workloads, scaling without limits, and saving money. Acronis Backup Solution is a safe, scalable, hybrid cloud solution that protects all of your computer systems and mobile devices, anytime, anywhere. Highly customizable and cost-effective, Acronis provides cloud backup, disaster recovery and secure data access for SMBs and enterprise clients. Acronis backup solutions include physical, virtual and cloud server backup software, storage management, secure file sharing and system deployment. Acronis is the ultimate protection for Microsoft Office 365 email, contacts, calendar and attachments. Businesses can be at risk of losing their important data. Lost data leads to business downtime, customer dissatisfaction, regulatory fines, and lost of revenue. As a result, the IT admins must meet extremely high expectations. You need to keep your business running 24-hours a day. 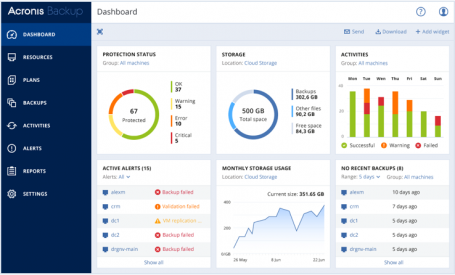 Acronis Backup 12.5 delivers the data protection solutions that meets today’s increasing data demands. It keeps your business running smoothly, protecting any workload, scaling without limits, and saving you money. Acronis is a industry’s leading data protection, backup software, disaster recovery, and secure data access solution provider to small-medium businesses, and enterprises. Acronis data protection solutions include virtual, physical and cloud server backup software, storage management, secure file sharing, and system deployment. Acronis products provide easy and safe solutions for data in local, cloud, and mobile devices, Powered by the Acronis AnyData Engine. World’s fastest cloud backup solution that protects all your data, located on-premises, in remote systems, in private and public clouds, and on mobile devices. With 15-second RTOs, cloud backups that are two times faster than the closest competitor, and support for 21 different platforms, it is the most advanced and most complete backup solution available on market today. 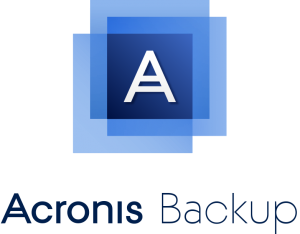 All our enterprise backup products provide seamless access to the Acronis Cloud. Simply add an Acronis Cloud Storage subscription to your purchase to fortify your backup storage plan and implement hybrid data protection. To find out more speak to one of our Acronis Sales Spacialist !